Eye love good news, don’t you? Ah, yes, I am a two year old, thank you for asking (hey, I warned you guys the eye puns were never gonna end…). So, long story short, I have a trip coming up at the end of the month, and I need new glasses (my last pair was so bad, the next doctor was convinced I was given the wrong lenses or something), so I scheduled an eye doctor appointment and got two unexpected bits of good news. I now have 20/20 vision in my good eye. I’ve mentioned before that I am pretty much blind in one eye due to an accident when I was very young. Well, in my other eye, my vision was, at best, 20/40*. Not terrible, but not perfect either. Just a little bit nearsighted. Again, no big deal. Well, when the doctor checked my vision this time, he said the surgery must’ve shifted my eye just right or something, because I now have “perfect”** vision. I had noticed before that my vision seemed changed, but I thought maybe the tumor had been affecting it, and now that the tumor was gone, my eye was just going back to normal. Apparently not, though! Hey, I’m not complaining. Had a tumor removed and a corrective surgery, all in one! Not a bad deal, hey? I do have a prescription for new glasses though. Went and turned it in on the same day, so I should have my glasses here in a week or two. I went all out on the lenses. Got myself some transitionals so I don’t have to worry about losing my sunglasses. Again. For like, the millionth time. My eyes are leveling out. August 2016 – Left eye appears to be lower than right eye. The way I eventually found out about the tumor behind my eye was because of the proptosis – or bulging out. When you looked at me, it looked like one eye was lower than the other. The first time I noticed it, I thought I’d had a stroke or something, because that was the only explanation I could think of for one eye to be lower than the other. After the CAT scans and MRI though, it turned out that the tumor was pushing my eyeball down and out. That was why my face looked all lopsided. After the surgery, my eyes still looked off to me, and I figured my face was stuck that way because of how long it took before the tumor was removed. Our skin only has so much elasticity, and it decreases with age. I’m not exactly a spring chicken anymore, so I pretty much just resigned myself to my new look. I asked the doctor about it though, and hey, surprise, surprise. He said that they’re almost back to normal. July 2017. About two weeks after surgery. Eye lid still swollen, but looking much better. Whether or not my left eye will continue to move back into place, we don’t know. Honestly, we probably won’t know until it finishes moving. In the meantime, though, I’m happy. I actually put on makeup for the first time in almost two years the other day. Before, if I put on any kind of makeup around my eyes, it just made the difference in their positions stand out even worse, so I had stopped wearing it for the past year. Plus, right after the surgery, it hurt to mess with my eye, so trying to put on eyeliner or eye shadow was just NOPE. So, yeah, there you have it. Good news and more good news. My next official after-surgery check up will be next month, but considering the news I got this past week, I think the check up should go well enough. Fingers crossed, anyway. I am so ready to be done with hospitals and check ups. Especially the ones that are first thing in the morning. Side by side comparison. Forgive the crappiness of the “before” picture. NO ONE takes a good picture at the DMV, and I didn’t take any other pictures before. 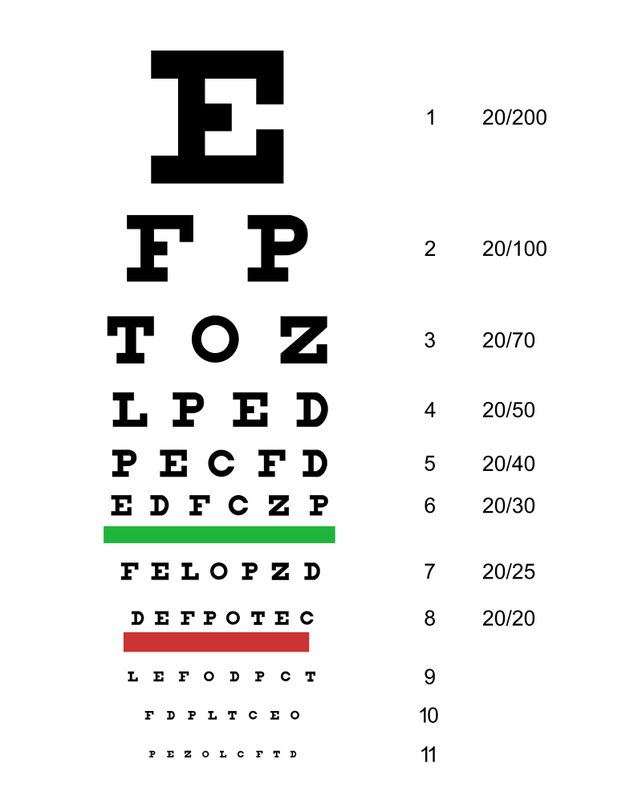 * For those of you wondering how the whole 20/20, 20/40 thing works: Basically, if you have 20/40 vision, it means that you have to be standing 20 feet away from something to see what someone with 20/20 vision can see, standing 40 feet away. ** Despite common belief, having 20/20 vision does not mean your vision is perfect. 20/20 only applies to the clarity of vision. I have slight astigmatism, so even though my vision is clear, it’s not perfect.